Festivals are social celebrations, encouraging us to reach out to others, create new or consolidate existing bonds and celebrate joy collectively. We believe this objective should be furthered to form a bond between India and Pakistan. Aaghaz-e-Dosti facilitates exchange of greeting cards between indian and pakistani schools on independence day, new year and festivals. Independence Day is especially a time of great jingoism and so the objective is to send message of peace. Cards are also exchanged to express solidarity when any tragedy happens across the border. Students of grade 7 from Ecole Mondiale World School, Mumbai, India participated in Aaghaz-e-Dosti’s initiated program called ‘Let’s Exchange Peace on New Year’ with students of grade 7th and 8th from Lang Lands School & College, Chitral, Pakistan. 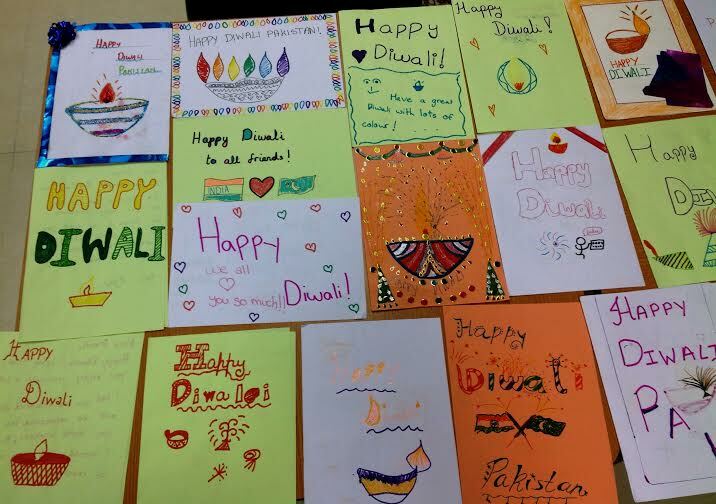 Ecole Mondiale World School took the initiative to make and send Diwali greeting cards to a school in Pakistan. This initiative was facilitated by Aaghaz-e-Dosti and cards were sent to Air Foundation School System, a school in umerkot in Sindh, Pakistan. 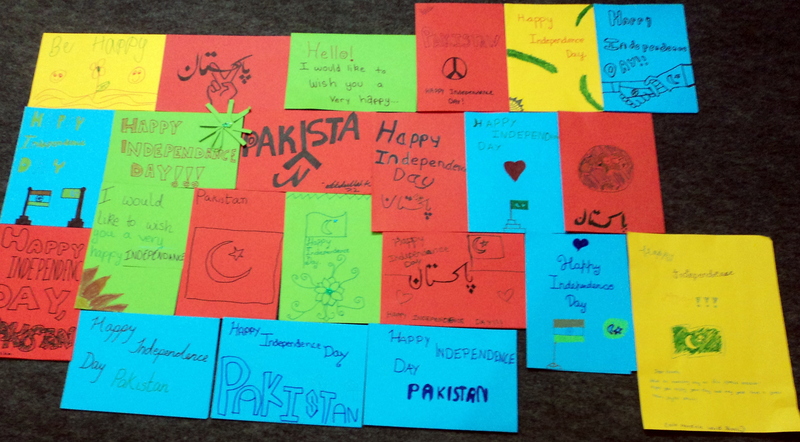 Ecole Mondiale World School (Mumbai) initiated a beautiful step towards friendship with having their 7th grade students to make cards for Pakistanis wishing them on their independence day. 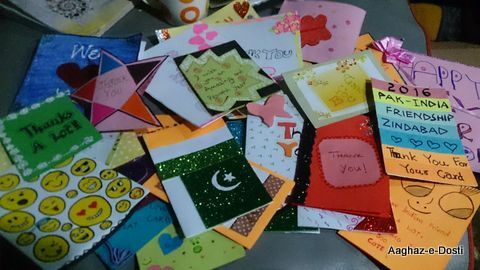 The cards were sent to Aaghaz-e-Dosti (An Indo-Pak Friendship Initiative) to be sent to a school in Pakistan. The cards were sent to Namra Nasir from Lahore who shared the cards with students of Excellent Education Centre. 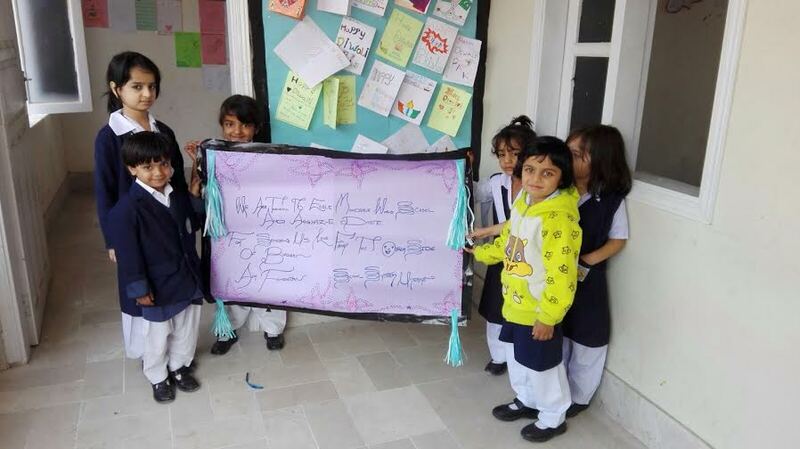 The students in Pakistan warmly received the cards and also made and sent cards for their Indian friends.